I don’t think that Batman would want to eat cookies, cupcakes or cake. He is not that sorta person. Here, I try to create a powerful treat that would appeal to the mighty masked one. 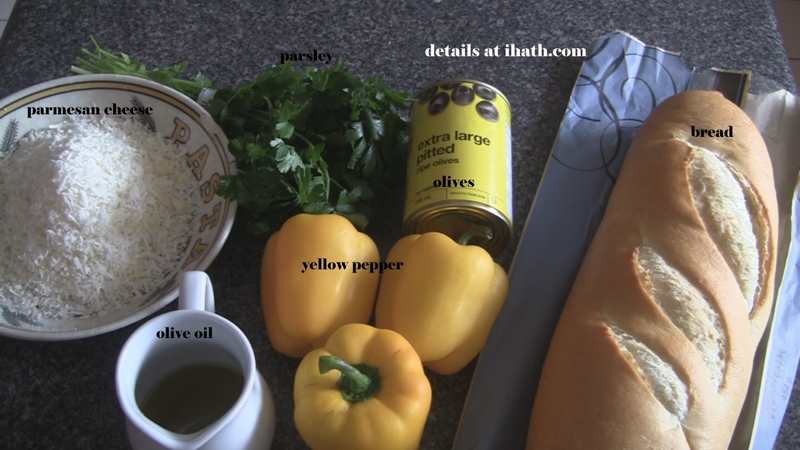 Using the concept of bruschetta, I created a pesto with yellow bell pepper and a tapenade. Mmmmmm! Gotham city never tasted so good. I think this is the kind of food that might tempt Batman and get him to forget about saving Gotham city and learn to enjoy life instead. Or who knows? perhaps eating this will turn the rest of us into crime fighting vigilantes. I get to see lots and lots and lots of super-hero action movies. My son (age 13) loves these movies and therefore it has become mandatory for me to see them all. Superman, Spiderman, X-Men, Star Treck, Godzilla … you get the picture. Most of them, I find unbearably boring. Good guy wins over the bad guy – is the standard, yawn inducing plot line. However, observing the enthusiasm that my son exhibits while watching these movies is how I enjoy these movies. Suddenly, a giant plastic toy destroying the city of Tokyo becomes the Most. Awesome. Thing. Ever. Oh! the exuberant enthusiasm of a 13 year old boy. However, The Batman movies by Christopher Nolan are an exception. I enjoyed those movies without any intercession by a youngster. Sliced the bread into think slices. Brushed each slice with olive oil. Sprinkled with parmesan cheese and chopped parsley. Placed the bread slices in a baking sheet and baked on 400 for 10 minutes. Toasted the bread like this will prevent it from going soggy once the toppings are spread on the bread. I roasted the yellow peppers in the over, peeled them and then pureed them with olive oil, parmesan cheese, salt and pepper. My olive tapenade is super simple. I experimented with different recipes in the past. But my favorite is to puree black olives with a touch of olive oil and a table spoon of water. Nothing else. Not even salt or herbs. 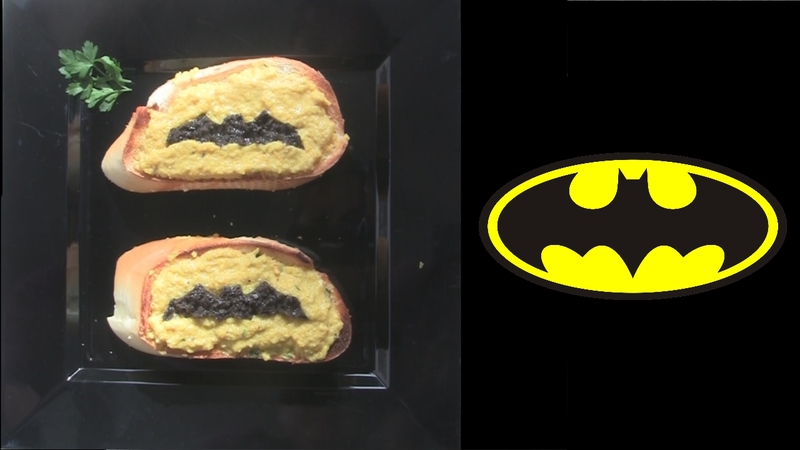 Placed a batman cookie cutter on the toasted bread. Spooned the tapenade inside. Using a chopstick I scraped the sides of the cookie cutter and spread the topping evenly across the surface. Then using the thicker side of the chopstick and pressed the contents down to compact it. Spooned the yellow pepper pesto on the outside of the cookie cutter. Using a chopstick I pressed the contents into shark edges. I carefully pulled out the cookie cutter and voila! I have to say that I enjoyed my own creation. It was both tasty and visually stunning. Although I had made tons (much more than what you see in the video), it all got demolished by the end of the day. I served it with a simple soup and salad and that was our dinner that evening. My son called it garlic bread even though it contained no garlic. I think I have overdone my “inspired by Italy” food series. I feel like a cliché. I went to Italy. I ate great food and now I can’t shutup about it. Enough! next week I need to do something that has nothing to do with Italian cuisine. What is the most radically un-Italian dish you can think of?